EDITOR’S NOTE: In Ponzi Land, HYIPs that suggested returns of 1 percent (or more) per day “worked” to line up lambs for the slaughter. So did autosurfs that planted the 1 percent a day (or more) seed. Now, 1 percent a day (or more) “auction” sites are “working.” Will they mushroom globally like HYIPs and autosurfs, setting the stage to fleece participants in unprecedented numbers? Apparently now fully recovered from his purported bout with Dengue fever, legendary HYIP huckster “Dave” is back — this time with something called “DailyCashMania” (DCM) that appears to be married to a nascent penny-auction site known as “HawkPay” that is luring affiliates amid DCM promises it will offer a “mega-prize” of a $10,000 cash voucher. Separately, a penny-auction site known as “BidsThatGive” says it will formally launch tomorrow to make the world a better place for children. Like the AdSurfDaily Ponzi scheme, some of the chatter for BidsThatGive involved the recitation of names of people who had some sort of tie to the institution of the Presidency of the United States. ASD’s chatter about the Presidency quickly brought out the U.S. Secret Service, which discovered ASD affiliates were being paid with money from other affiliates: a classic Ponzi scheme. The Secret Service also discovered that political donations made by ASD President Andy Bowdoin came from Ponzi money. Other prelaunch hype for BidsThatGive claimed that affiliates of the “program” could get filthy rich, so rich the company would pay to name a hospital or orphanage after them. Meanwhile, the Zeek Rewards MLM “program,” which is married to a penny-auction site known as Zeekler, has announced a new slate of officers at Rex Venture Group, the purported parent company of the Zeek businesses. Even as the company was making the announcement, posters on the MoneyMakerGroup Ponzi board were sharing “I Got Paid” posts. Another poster placed a link to something called ZeekCalc, a purported earnings calculator apparently created by a Zeek fan. Earnings calculators were part of the ASD Ponzi scheme. ASD, like Zeek and “Dave’s” emerging DCM “program,” also had a presence on the Ponzi boards. An earnings calculator also was used in “Dave’s” JSS Tripler 2 scam. 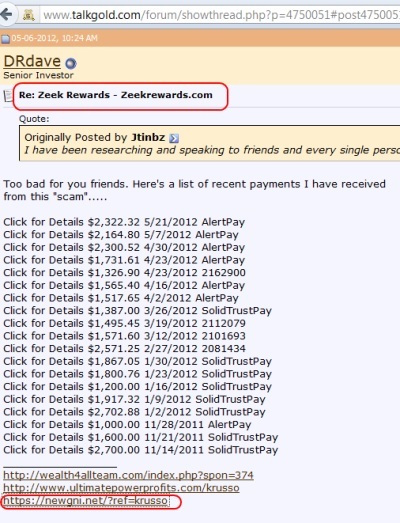 Among the apparent Zeek affiliates bragging about their Zeek payouts at MoneyMakerGroup in the run-up to Zeek’s announcement about its new officers yesterday was legendary Ponzi promoter “strosdegoz,” a former cheerleader for “Dave’s” scams, along with the OneX scam and the ClubAsteria scam — and many others. “strosdegoz” has claimed to be a member of 35 HYIP boards. Among other things, Club Asteria traded on the names of the World Bank and the American Red Cross. Hank Needham, one of Club Asteria’s purported managers, was a former AdSurfDaily pitchman and cash-gifting enthusiast shown on videotape opening packages of cash from at least two countries. The post went on to claim a July 30 Zeek payment of $23.98 from Rex Venture, Zeek’s purported parent company. Just plain “Dave” of the emerging DCM scam perhaps is most infamous for a “program” known as JSS Tripler 2, which appears to have based its name on the JSS Tripler/JustBeenPaid “program” purportedly operated by Frederick Mann, a former ASD pitchman. JSS Tripler 2 soon morphed into something called T2MoneyKlub and launched a companion scam known as Compound150. T2 Money Klub and Compound150 appear to have collapsed after “Dave” purportedly was battling back from a bout with Dengue fever. But now “Dave” appears to be back with DCM and its work-in-progress “scratch” auction. The new Rex Venture Group officers announced yesterday, according to Zeek’s news Blog, include Greg Caldwell as “acting COO”; Josh Calloway as CTO; Clifton Jolly “to head up PR”; Angie Fiebernitz as CFO; and Alex de Brantes as executive director of training and support services. Dawn Wright-Olivares is Zeek’s new “Chief Marketing Officer,” after previously serving as “acting COO,” according to the Zeek Blog. Dengue fever was very original idea. And people say that HYIP scammers have no originality. Idiots that “invest” there deserve to lose their money. I bet nobody would give money to somebody without verifiable last name who you never seen before, but on Internet it is apparently fine.